This is the time of year when my thoughts turn to the confluence of shepherding and writing. It’s lambing season and I end up spending some of my prime writing time sitting with pregnant ewes or newborn lambs. While I observe the sheep, my mind is on my characters. I swear I have a whole book of essays on the things my flock teaches me about writing. Last week I’d finished writing about two-thirds of my new young adult novel when my characters took a right turn when I expected them to take a left. Even though I plan my novels well ahead of time, I usually accept that these turns happen organically. My characters are complex and sometimes their actions surprise me. My usual reaction to character independence is to go with the change. My thought in doing so? For better or worse, this is my story. It wouldn’t be authentic for my characters to react any other way. I’ve re-plotted entire endings after turns like these. This time I worked the same way. At the heart of the matter: I was infatuated with the decisions my characters made. They surprised me and impressed me. They had courage and strength I never imagined. Their actions brought out aspects of their personalities just below the surface. The outcome even changed the way I viewed the bad guys. I was blown away. Then my work came to a halt for lambing. I sat outside with a ewe’s head in my hands, comforting her through a series of difficult contractions, and I realized something was wrong. Her labor was moving forward, but it wasn’t going as planned. She hadn’t progressed far enough for me to determine the problem, but I knew. Normally so much pressure would be opening things up. Instead her possibilities seemed to narrow the more she pushed. Waiting with her, my mind raced ahead through the next scenes in my novel. My lovely characters dashed into uncharted territory and I re-plotted the book in my mind. It was all so good and fresh and wonderful. Then I saw the scene I never expected: the last scene. It came up on the horizon about 20,000 words earlier than expected. If I followed the natural trajectory of the new scenes, I would lose the opportunity to write a huge chunk of my novel. As enthusiastic as I felt about the recent turn of events, about the exciting new character dimensions, I couldn’t abandon those 20,000 words. I knew without doubt that those words not yet written contained much better stuff than the last 5,000 that made my heart flutter. As I sat there that day, considering turning my novel into a novella because I loved the new ending so much, my ewe finally progressed enough for something to appear. It was the tail of her first lamb. No legs to go with it. No nose. No hoofs. Just the tail. Back in the house, I scrubbed up and changed clothes and found supplies. There was no way around what had to be done. The lamb had to go back inside far enough for the hind legs to come forward, then it had to be pulled quickly, so it would survive the sudden break of the umbilical cord. I don’t enjoy this part of shepherding, but without it, the lambs and the ewe die. 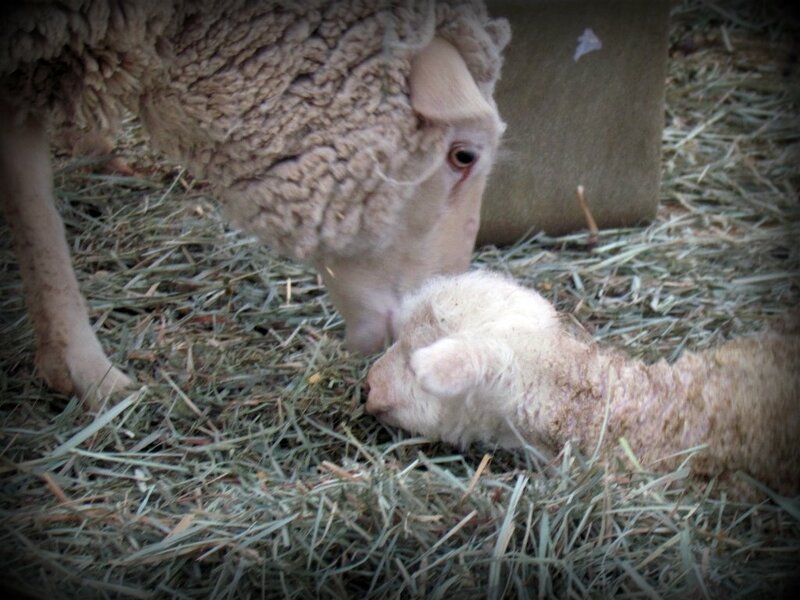 Pulling that first lamb, seeing her breathing, that’s when I realized: organic character development is not reason enough to accept a story’s unplanned demise. Sometimes the natural progression of a thing takes us to the wrong place. Sometimes, no matter how painful, we have to back up and find the path that creates the ending we desire. Three lambs were born that day. They survived the birth. The ewe survived their birth. About them, I have more stories to tell. I cried a lot. I always do. Then, once they’d settled in the barn, I went inside and pushed my story back 5000 words. What a lovely post. Writing in relation to down-to-earth life. I often have that problem too - endings appear that all seem right but that aren't the final answer. It's always an adventure, for the writer even more than for the reader. Godd luck and life to all your lambs.. and your stories! Oh what a beautiful post Johanna, how blessed you are to have the privilege of actively helping deliver new lives into this world, I envy you! This year I hope to hold a new born lamb, a much long desired dream. Best Wishes to your house lamb, may he grow stronger every day. How you can delight a squeamish person like me with a post about down-and-dirty lambing is beyond me, Johanna. As always, you're a delight. I was with you every step of the way, whether about writing, lambing or the two intertwined. I'm mulling the writing lesson now. You may have shown me what's wrong with one of my to-be-edited novels. Thanks for the post and the lesson. Great post Johanna. Love the photo. Thanks, Patricia! You said that well. An ending can feel right, but there might be more than one right ending. We have to choose the best one. Thank you, Ann! It's great to see you here. I so hope you get to hold that newborn lamb! On another note, I just looked at your photoblog again. It is so beautiful. Thank you, Jess. My lambing notes often become too graphic. Glad to know it was okay for you! The organic unfolding of a story has created issues for me in the past. I'm surprised it's taken me so long to realize that there can be more than one unfolding. I can't wait to read that novel! This truly resonates. Thanks for sharing this part of your journey. Looking forward to reading about how this progresses. I love this! :) My characters do the same thing, they surprise me. Love this post and the photo. I also love the parallel to writing. Beautiful! Life happens. Whether living or writing, it happens. Thanks for the lovely sentiments. Great post Johanna! Inspiration and what drives writers through our writing is always amazing to me! Keep us posted on those adorable little babies! Great post! My daughter just got to WA state to work on a sheep farm (organic gardening/bees/sheep) - and I can imagine she'll see/help with some of this. Your thoughts are definitely helpful to me. I sometimes follow my characters to the detriment of the story! Hopefully next time that seems to be happening, I'll be ready to push back & pull for the right ending! Congrats on some successful lambing! I'm so glad the lamb(s) made it! My current wip seemed to do the same thing. I settled on a novella-maybe I should re-think it! This is what happens when strong characters make their voices heard. Sometimes you have to reason with them. Great post. So true. Thank you, Janis! Thanks, Maredith. Yes--the variety of inspiration among writers is really wonderful! Oh your daughter will have stories! Thanks for your well wishes. It's always great to connect with kindred souls who are working to improve their writing. There are so many possibilities. I rewrote that key scene six times before my characters finally went the direction I wanted them to go. The process was a great learning experience. Usually my characters do know best, but I have to put them in a situation so they authentically move to where I want them to be. Easier said than done!